In today's sports marketplace, properties are expected to deliver a higher quality live game experience for fans than ever before. With new advents of technology, rising ticket prices, and the evolution of the at-home viewing experience, teams are consistently pressured to push the envelope as they look for new ways to create memorable experiences for fans attending games. In recent weeks, two organizations turned to unconventional game entertainment techniques to engage their fanbases in new ways. Check out the two examples below and consider ways that your organization can introduce new forms of entertainment and excitement for fans! The Hawks organization recently partnered with the Georgia Lottery to execute a 3D halftime light show that helped educate and inform fans about their new $2 Powerball game. The Hawks created a 3.5 minute show that was projected on the basketball court floor that created excitement around Powerball in a compelling, non-intrusive manner. The Boise State Marketing team recently pulled off a tremendous student section ("The Corral") flash mob performance that generated an elevated level of excitement in the Taco Bell Arena. Students wearing matching orange shirts and blue headwear performed two (2) choreographed dances in unison that took everyone in attendance by surprise. In recent years, the emergence of social media has placed increased pressures on sports organizations to deliver new, compelling content for fans to enjoy. As a result, many teams have looked to create exclusive gameday camera angles that provide fans with unique vantage points of the action. Over the past few years, airline partners have invested more time and resources into their team, league, and event sponsorships. Airlines have invested in branding aircraft with team marks, developing loyalty programs for fans, creating ownable stadium destinations, and distributing free ticket vouchers to fans in attendance. While airlines have sought to activate their partnerships more actively at airports nationwide, one tactic that we have not seen executed to date in conjunction with a team partnership is projection mapping. Just think how amazing it would be to look out the window at the airport and see a virtual Tom Brady throwing a touchdown pass to Deion Branch along the side of the plane. While projection mapping would likely need to be a one-off marketing/PR stunt, it would be fun to see an airline promote team partnerships in its hometown market by featuring a different projection display along the side of an aircraft (or inside along a wall in the concourse) every night of the week. As shown below, Air Baltic recently generated buzz during the holiday season by featuring a projection mapping stunt at a Latvian airport that showed a team of virtual elves raiding a plane that was stationed at the gate. The marketing tactic, which caught passengers by surprise, was filmed and uploaded to YouTube and instantly generated 24,000+ likes in less than a day. Check out the clip below and consider new ways that your organization can leverage its partnerships with new forms of technology in high-traffic locales! As teams look for new ways to leverage social media, they should keep a close eye on related programs and tactics implemented by brands across the world. In recent weeks, Heineken launched two (2) innovative social campaigns that could easily be replicated by teams to engage their fanbases in new ways on game day. In Singapore, Heineken created a "Social Christmas Tree" out of 48 LED screens towering eleven meters high that became a destination for consumers to send messages to their friends and family around the holidays. Heineken allowed consumers across the world to submit greetings and messages that would be featured live on the Heineken Social Christmas Tree - an effort that truly united people from across the world and visibly brought social media to life in the public space. Sports Application: Sports organizations can consider creating a "Social Tower" within the concourse level where fans across the world can upload photos, videos, tweets, etc. that are displayed on gameday. Teams can also provide fans on-site an opportunity to film live videos that are displayed on the tower throughout the season, etc. The Social Tower can serve as a great way to unite fans from across the world and truly allow fans at home to feel connected to the stadium experience. Creating such a stadium landmark can also serve as a seamless play to incorporate messages and content from corporate partners. Heineken recently enhanced the experience for music attendees at the Heineken Open'er Music Festival with some creative activation utilizing giant QR Codes (referred to as "U-Codes"). Heineken drove engagement amongst attendees by featuring a footprint on-site where fans could videotape a personal message (detailing who they were, where they were from, what there interests were) and have it embedded into a giant QR code sticker that was printed out and placed on their clothing. The U-Codes proved to be great ice breakers for festival attendees and generated so much buzz that over 5,000 people received them over a 4-day period (exceeding Heineken's expectations by 200%). In recent years, Olympic athletes have taken many different approaches to support their training regimens, NGB's, and lifestyle.With the 2012 London Olympic Games less than 300 days away, U.S. Olympic hopeful Nick Symmonds recently set up an auction on eBay that allowed one (1) brand an opportunity to place a temporary tattoo on his shoulder for the 2012 track and field season. With the auction open for bid by any company/agency, Milwaukee-based Hanson Dodge Creative (HDC) capitalized on the opportunity and placed a winning bid of $11,100 for the rights to place their brand's Twitter handle (@HansonDodge) on Symmonds' shoulder during several upcoming races, including the Sydney Grand Prix and possibly the Olympic Games if Symmonds qualifies. What's interesting about the Symmonds-Hanson Dodge Creative partnership is that it entails much more than a standard agency branding play. As a leading active lifestyle agency, Symmonds will serve as a Running and Outdoor Active Lifestyle Advisor for Hanson Dodge and will help the agency develop a dedicated Advisory Board. In turn, Hanson Dodge will work with Symmonds to strengthen his personal brand through strategic marketing communications recommendations and drive his business efforts. The Symmonds-Hanson Dodge Creative partnership serves as a great case study of how athletes (across all sports) are working more closely with agencies and other entities to build their personal brands. While ambush marketing remains a key concern heading into the London 2012 Olympic Games, it will be interesting to see if more athletes turn to similar auction processes to generate awareness and sponsorship dollars. HDC's partnership with Symmonds is very smart, as it serves as a very strong positioning play and will surely generate a return (from media exposure) that exceeds their investment. Manchester City FC recently teamed up with Jaguar to create a pretty thrilling form of halftime entertainment for fans to enjoy that can be replicated in most other major professional sports. The game, called Boot the Boot, tasks select fans with attempting to kick soccer balls from a distance into the trunk of a Jaguar that is parked within the corner tunnels of Etihad Stadium at the playing level (a trunk is commonly referred to as a boot in Europe). The promotion is perfectly suited for in-game entertainment because it adds a level of excitement while seamlessly integrating the Jaguar brand into the experience. Check out the MCFC-Jaguar "Boot the Boot" promotion below and consider new ways that your organization can integrate automobile partners in a fun, memorable way for fans! The sports marketplace will be driven by mobile marketing, social TV, industry consolidation, and globalization in 2012. Mobile marketing will continue to shape the sports industry as properties and brands look to optimize their mobile offerings, develop robust applications, and deliver content in new ways. Organizations will look to augmented reality, social gaming, and geo-location based services to serve as new means to engage fans. In turn, fans will continue to embrace the TV Everywhere experience and access live, streaming and On Demand content via their mobile phones, tablets, and other devices on the go. Brands and properties will continue to invest in the social media space as fans gravitate to the notion of social TV creating a communal viewing experience that delivers real-time engagement, insights, and unique vantage points. Properties will sharpen their social media focus in 2012 by developing smarter, more holistic strategies, hiring dedicated personnel, and creating their own monetization models by integrating corporate partners. The sports marketplace will also be impacted by the effects of industry consolidation, aggressive rights acquisition strategies, and globalization. Networks will continue to form partnerships in an effort to build robust platforms to host premiere events (e.g. Olympics, World Cup, etc.) while teams will dedicate time and resources to build out video content distribution strategies that reach fans across the world. The London 2012 Olympic Games will be touted as the sports story of the year while the Barclays Premier League, UFC, and college athletics will continue to grow their businesses significantly in new markets worldwide. Welcome to the December 2011 Partnership Activation 2.0 Newsletter! Thank you for your continued interest and support for Partnership Activation and the monthly newsletter. Click here to purchase the December 2011 Partnership Activation Newsletter for $7.99. Click here to purchase the December 2011 Partnership Activation Newsletter, connect with other readers in the official Partnership Activation LinkedIn Group, and follow Brian Gainor on Twitter for additional sponsorship/marketing tactics throughout the month! I wanted to send a special thanks to Forbes Magazine for the inclusion in their 2011 "30 Under 30" list in the category of Entertainment. It's a true honor to be featured alongside some of the brightest and hardest working individuals in the industry. 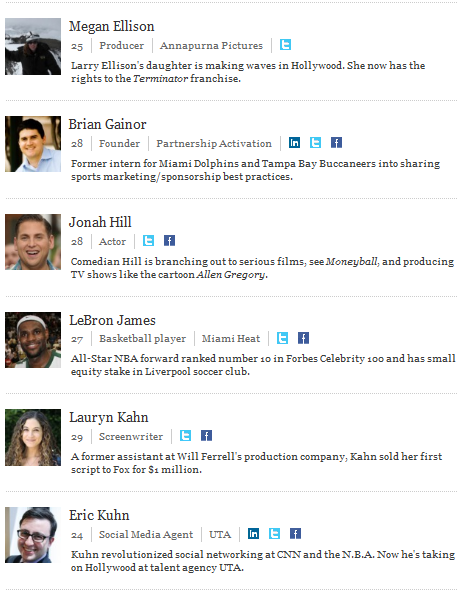 I want to also send a special congratulations to industry friend Chris Chaney for making the list as well! If you are not familiar with Chris, he is the CEO of Chaney Sports Group, the Founder of the Ivy Sports Symposium, and one of the most genuine guys in the business. Thank you to all the readers and avid supporters of PartnershipActivation.com and the Partnership Activation 2.0 Newsletter ... and to all my family, friends, and colleagues at GMR Marketing for their continued support. Check back to PartnershipActivation.com for more exciting content to come! Looking for multimedia best practices from across the NHL? As an official sponsor of the U.S. Olympic Committee, BP recently released an innovative new augmented reality campaign that gives consumers a chance to face-to-face with some of the world's best athletes. BP teamed up with nine U.S. athletes to develop an interactive trading card series that will be included in the December 19th issue of BusinessWeek and featured on BP's website. 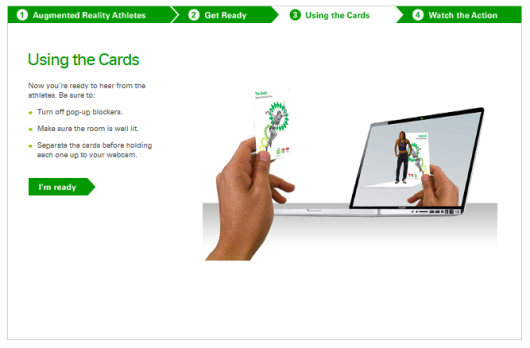 Consumers who download the trading cards can hold them up to their computer screen or a mobile phone camera and see them come to life as the athletes digitally appear in front of the user with exclusive training tips and information about themselves and their sports. Check out BP's augmented reality trading card series here and learn more about their commitment to Team USA on their official Facebook page. Numerous opportunities exist in the sports space for teams and corporate partners alike to reward loyal fans for their perfect attendance during a season. While most professional organizations will periodically honor fans who have been season ticket holders for 10+ years, very few go the extra mile to thank fans for their commitment on a regular basis. The University of Florida Student Ticket Office recently thanked season ticket holders for their loyalty with a simple, yet impactful gesture that should be replicated throughout sports. Travis Leyndyke and his team in the UF Student Ticket office emailed all ticket holders who had their tickets scanned for every home game during the 2011 football season to thank them for their support. Fan congratulatory emails can serve as a great platform to integrate corporate partners as well, as they present an opportunity to tap into the University/team's most avid fan base and sincerely acknowledge/reward them for their support. Properties can also consider creating a virtual wall on their official website that features all fans who had perfect attendance throughout the season (a platform that could be sponsored by a brand who provides an exclusive promotional discount/reward). Check out the University of Florida's email communication below and consider new ways that your property can acknowledge fans firsthand for their support! In recent months, 3D art has become a popular, non-traditional tactic for sports properties and their corporate partners to generate awareness in a fun way. As entities continue to mine for new ways to "escape the clutter" on game day, 3D art has proven to be a creative solution that surely generates the impressions that brands are looking for. Reebok recently turned to 3D art to promote the CrossFit Games, its supported fitness program. CrossFit is a strength and conditioning program and licensor of 3,000+ gyms that is gaining interest and traction with fit consumers worldwide. Reebok partnered with two legendary 3D artists to create the largest ever 3D street art display and set an official Guinness World Record. The result? Reebok and Joe and Max created a 1,160.4m 3D art display at London's West India Quays, Canary Wharf that generate a significant amount of interest. Reebok turned the exhibit into an engaging display by allowing public onlookers to participate in a Reebok CrossFit workout of the day on top of the artwork - a truly memorable experience.